Now that you have your practice Flower Grid printed, let's move on to the next step. At the top of the flower sheet, you will see slanted lines (highlighted in yellow). These are the slots that you write down the name of each flower you'll be using in a flower design. My site consists of both flower tutorials and flower recipes. What's the difference? Flower tutorials will list all the flower varieties and products that you need to create a specific flower design. It will then take you step by step through the design process. Detailed photos and instructions explain everything in detail that you need. 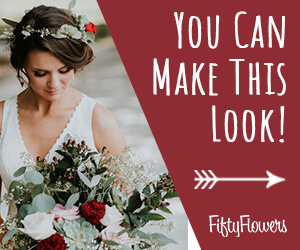 Flower Recipes, however, just show a picture of a certain design and then lists the flowers, how many stems of each flower are in the design and usually a list of the hard goods (such as scissors, florist tape, floral adhesive, etc) that you will need to create each design. This is where you have to begin to use common sense. If a boutonniere recipe and a corsage recipe both list a 32 oz bottle of "Finishing Touch Flower Sealant", you obviously don't have to order 2 full bottles. One bottle is usually sufficient for a standard sized wedding. Every flower tutorial, however, will list all the products needed. Do not duplicate hard goods or you'll be ordering too much stuff. 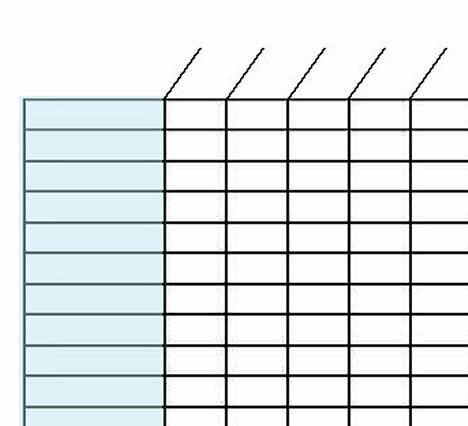 It works well to print off extra grid sheets. 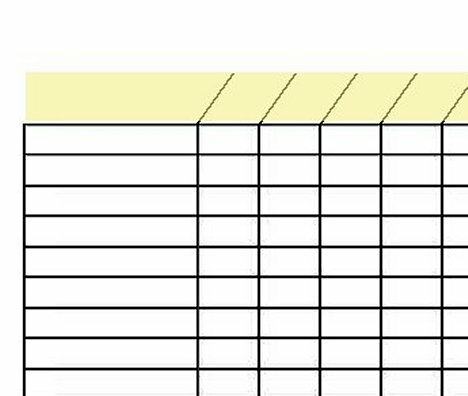 That way you can have a separate sheets for the hard goods, which will generally only be listed once or twice, depending on the amount of flowers you order. 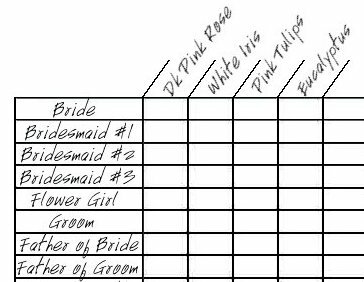 Down the left side (highlighted in blue) is where you list the names of everyone who will get a bouquet, corsage, boutonniere or other design. This is where you list the names of your wedding party. This is also where you list the other flower arrangements, such as centerpieces, pew ends, church altar sprays and more. If you have multiples (such as in centerpieces) you'll have to multiply each number for a single design by the number of designs you need. For example, if you list 5 roses and 6 carnations in a centerpiece and you need 10 centerpieces, you'll mark "50" column for roses and "60" in the column for carnations. Just use another sheet if you run out of room on the first one. Once the names of the wedding party and family members are listed, I generally start with the names of the flowers found in the bridal bouquet. Why? Because her bouquet is usually the one that reflects similar flowers in the attendants, corsages and boutonnieres. It is not necessary to include every flower in the bridal bouquet in all the other flowers. For example, she may have calla lilies in her bouquet, but this more expensive flower is NOT in the attendants or groomsmen flowers. You can match the groom, however, by including a single calla in his boutonniere. There is always room to add more flower varieties, such as cheaper varieties that make up centerpieces or buffet table pieces. Remember if you list centerpieces, that the numbers in the column is for a single centerpiece, and you'll have to multiply that number by the number of centerpieces you need. Standard roses or carnations may be too large for corsage work, so you may wish to substitute a similar color in spray roses or miniature carnations for the corsages. The Flower Grid numbers usually stand for stems needed. 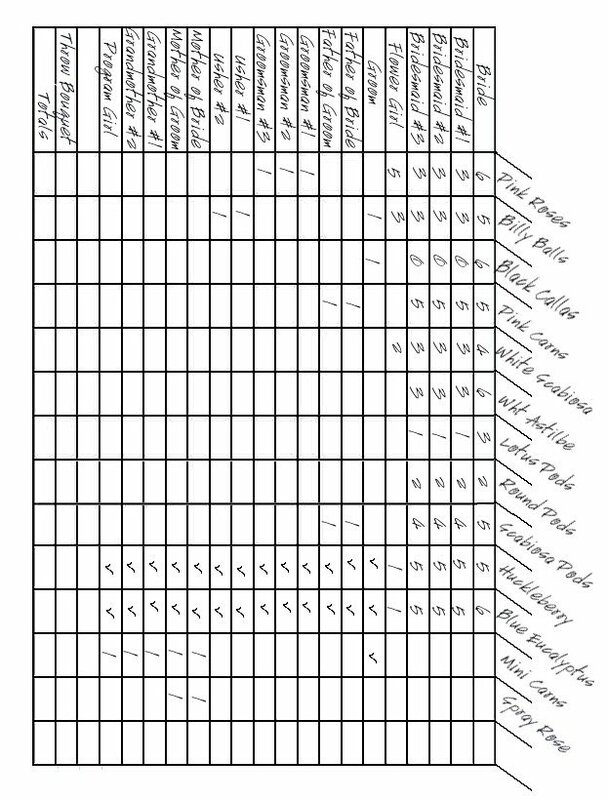 Print off the sample Flower Calculator below to follow along with as I explain the number of stems needed. Again, right click of the mouse, paste into either a Paint program or a Word Program and then print off. Got the sample sheet printed? Great . . . let's move on.